They say you never get a second chance to make a first impression. Even in the world of automobiles it's rather accurate, if you think about it. The importance of a good first impression can never be undermined. And that's something that Jaguar understands well. 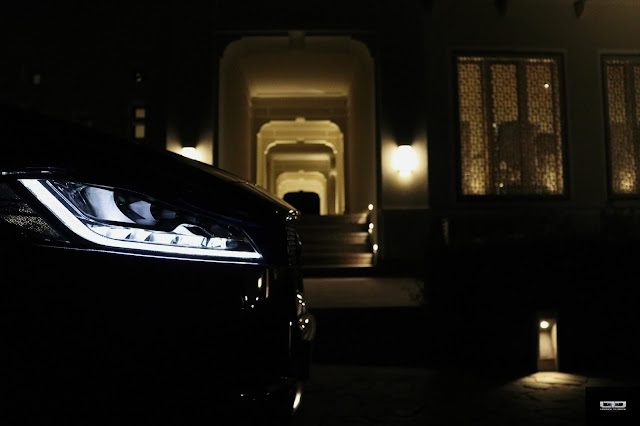 The marque makes it a point to make the first reveal of their vehicles utterly memorable, through audacious jaw-dropping spectacles that tame the impossible and challenge what is humanly off-limits. And does it with a remarkable sense of cool. 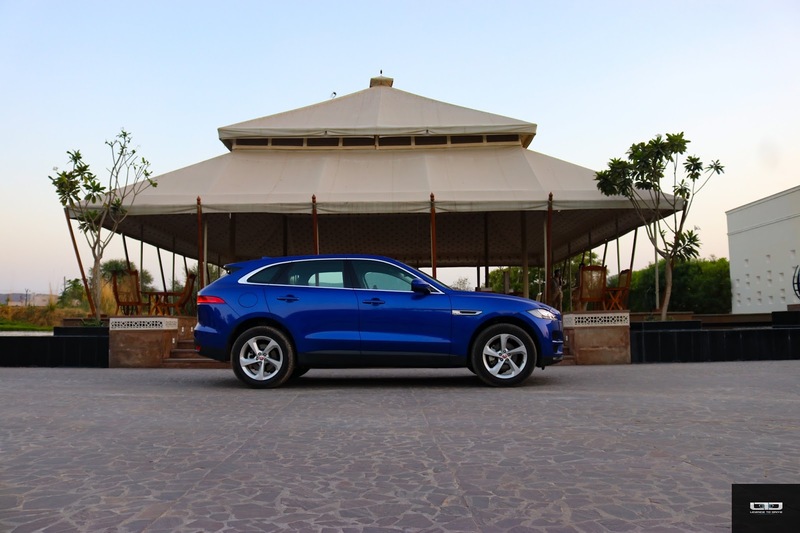 Which is why when Jaguar made its first foray into the widely popular SUV segment with the F-PACE, it did so with a sensational, gravity-defying public debut in September 2015. Stunt driver Terry Grant performed a record breaking 360 degree loop stunt in Frankfurt, withstanding extreme forces of 6.5G (more than space shuttle pilots) to loop the 19.08 metre loop. The move was aimed to bring into focus the performance SUV's lightweight construct and sports car-like abilities. It was tuned to perfection and on point. 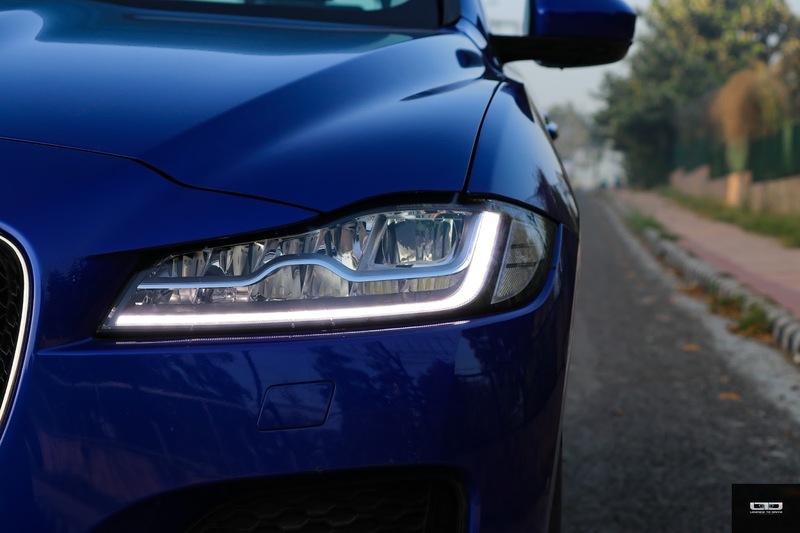 Much like the vehicle itself, which is a knockout package of style, sportiness and practicality with the unmissable Jag swag. Though the F-PACE made its debut in its 3.0L avatar, currently the locally manufactured 2.0L AWD Diesel Prestige is the only available model in India. 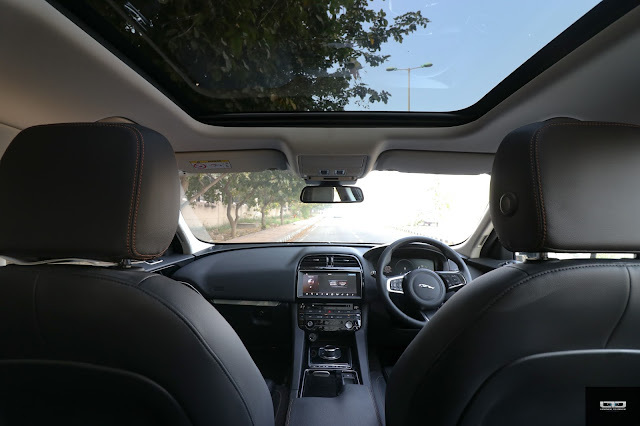 At INR 60.02 lacs (ex-showroom) it is priced more attractively than before, and almost 20% less than the previous CBU Prestige model, which definitely makes it an attractive deal and hasn't gone unnoticed. It is not easy being a johnny-come-lately in the SUV space but the F-PACE walked away with the World Car Design of the Year Award in 2017. The battle for market share is intense with well established competitors, but the F-PACE has carved a niche of its own, settling in somewhere between the BMW X3 and X5, and the Audi Q5 and Q7. 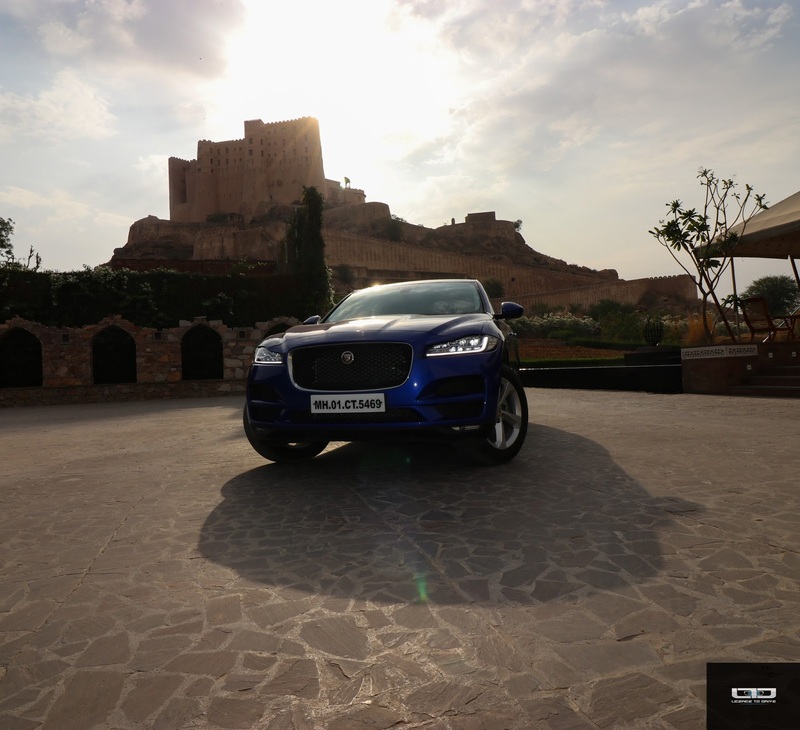 We recently took it out for a rigorous drive to the spectacular Alila Fort Bishangarh, an 18th-century warrior fort in Rajasthan, which has now been restored into a luxury heritage resort. Both the journey and the destination turned out to be equally enthralling. You can read more about India's latest luxury hotel here. Much like all Jaguar carlines, the F-PACE has a distinct aesthetic appeal that is hard to miss on the road. The overall design takes a lot of styling cues from the sedan and sports cars within the portfolio, with several feline elements that accentuate the leaping cat moniker. Up front, the F-PACE borrows heavily from the XE and the XF, with the large black grille giving it an imposing look from the front. The sculpted muscular bonnet is on point, and the strong lines continue on the sides as well. The sloping roofline gives it a sporty stance rarely seen on other SUVs, and makes for a very balanced and well-proportioned profile. The rear takes inspiration from the F-Type sports car with a similar tail lamp design and muscular rear haunches. The rear boot-lid spoiler is a nice touch that lends to its sportiness, and the large 19" alloys look good. They would have been sweeter in black though, a look that has made an appearance in the SVR edition. 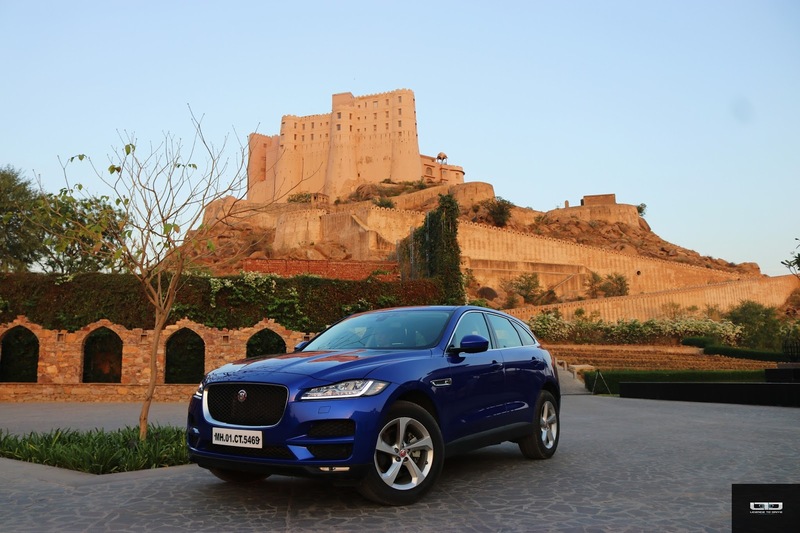 Few cars in the segment can beat the F-PACE when it comes to sheer desirability. It turned heads wherever it went, be it the wide tree-lined avenues of New Delhi, the Delhi-Jaipur express highway, or the dusty village lanes around Fort Bishangarh. 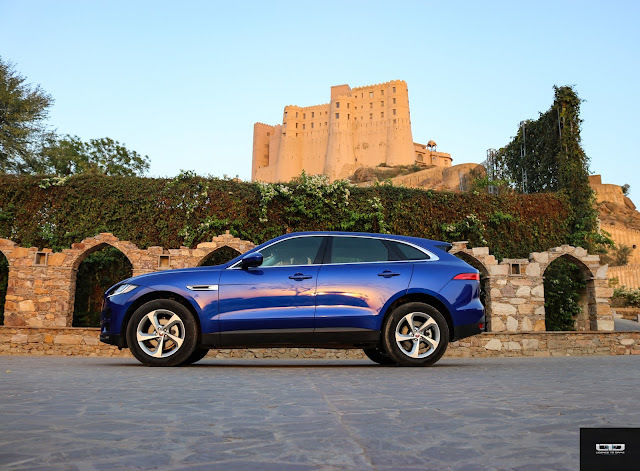 It strikes a fine balance between beautiful styling and outright practicality, and Ian Callum has left his indelible mark by incorporating Jaguar's classic styling cues and his own design language in an SUV body. This one should definitely go down in automobile history as one of the best looking SUVs of its time. Or perhaps of all time. 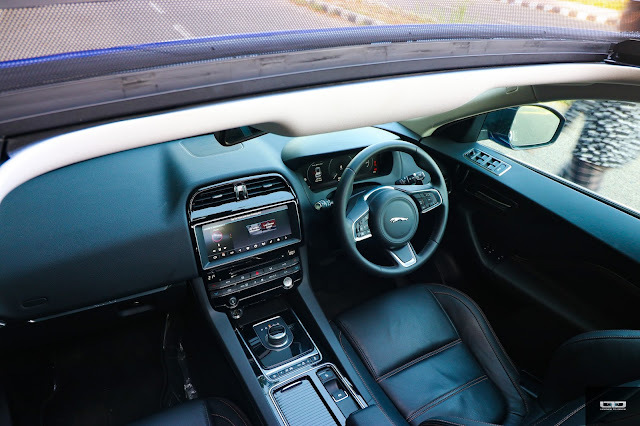 Jaguar has paid utmost attention to the interior of the F-PACE, and it comes loaded with all bells and whistles you'd expect from a flagship. The Prestige model packs in range topping tech, comfort and safety features without going overboard or adding outlandish features that add to the bling but don't do a thing. Inside it is all about sporty elegance as opposed to flamboyance. The luxury grained leather seats come with contrast stitching and can be electrically adjusted 10-ways and set to memory. 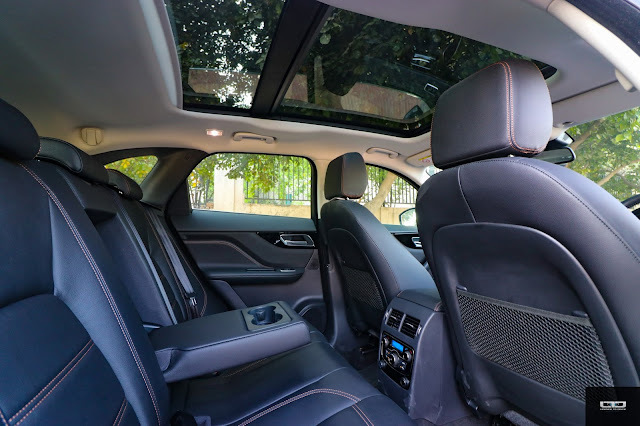 The electrically reclining rear seats, four zone automatic climate control, 10.2" touchscreen infotainment with bluetooth connectivity and streaming, wi-fi hotspot, voice command and full screen navigation are things that make life simpler on the highway. There is a panoramic sunroof and an impressive 380W Meridian audio system, along with staple features like cruise control, speed limiter, rear view camera, keyless entry, rain sensing wipers, auto headlamps, ambient lighting and more. The configurable ambient mood lighting and sensor controlled overhead lights turn the cabin into some sort of a personal lounge after dark. But our favourite feature has to be the 12.3" HD virtual instrument display which replaces the dials in front of the steering wheel. It is customisable in several ways and completely changes the way you interact with the car. The option of getting the full screen navigation on this display panel in the driver's line of vision is a game changer. While the infotainment system is one of the best we have come across, it isn't compatible with Apple CarPlay and Android Auto, and that is a disappointment. 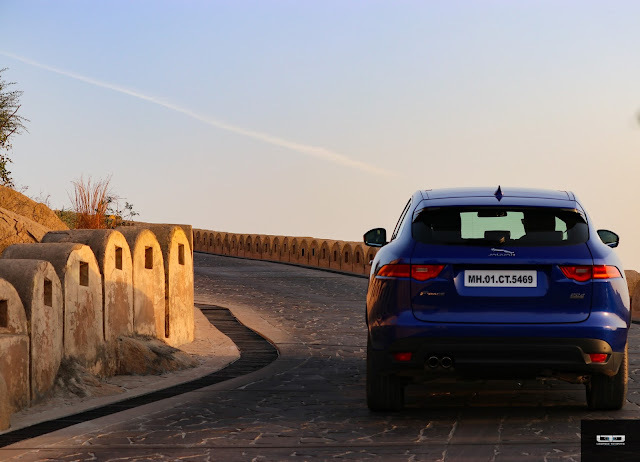 The F-PACE also misses out on ventilated seats, which would have been ideal for Indian summers. The cabin is comfortable, with ample rear legroom. Taller occupants may find the headroom at the back a bit compromised due to the sloping roofline design. But it isn't a deal breaker. The high transmission tunnel means that the F-PACE is best at seating four passengers comfortably. The cabin is practical with large door bins, cup holders and several storage spaces and cubby holes both in the front and rear. 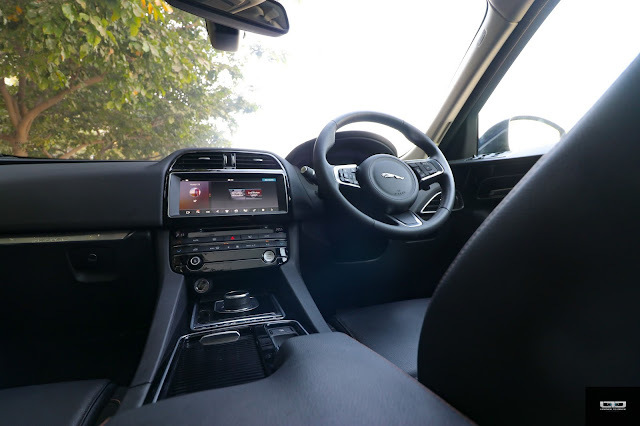 In terms of safety, the F-PACE comes with electronic brake assist, hazard lights under heavy braking, perimeter sensing alarm, rear ISOFIX for child safety seats, and airbags around the cabin (driver & front passenger, with seat occupant detector for passenger, front side, full length side window curtain). With the F-PACE, Jaguar has focused on driving capabilities more than anything. 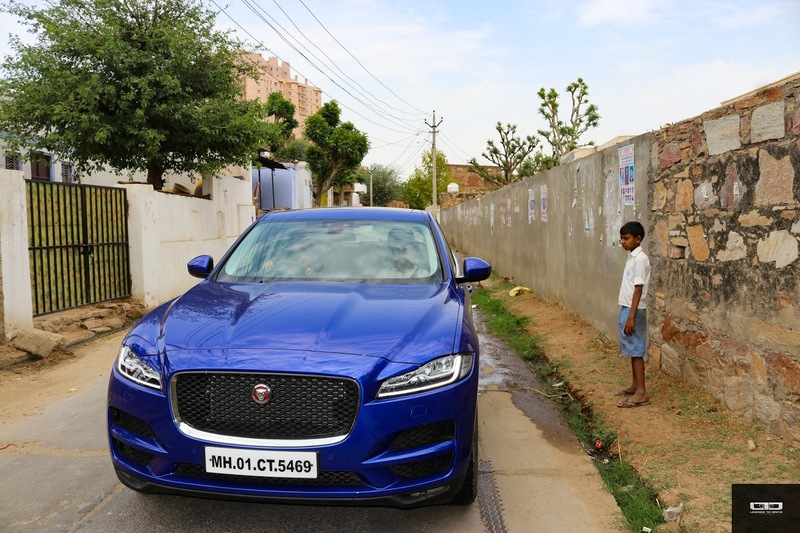 The 2.0L Ingenium diesel produces 177 PS of power and 430 Nm of torque, and is mated to Jaguar's 8-speed automatic transmission with paddle shifts & automatic stop/start function. There is a choice of four different drive modes - dynamic, eco, normal and rain/ice/ snow and one can switch between a regular drive or a sport mode. The paddle shifts make for a more engaging drive experience and offer better control for enthusiasts. While the motor may seem a bit down on power and sound a bit coarse, all is forgiven for the way the F-PACE drives. 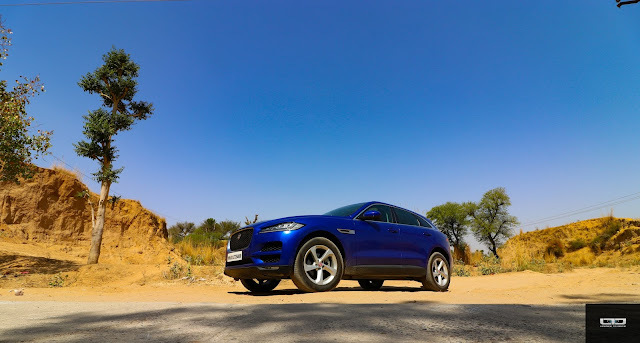 The driving dynamics are magical and the F-PACE hugs the highways like no other SUV. Looking at it, you'd never expect it to drive the way it does. It's a brilliant highway cruiser, and the direct steering and firm suspension give it a tight feel around the bends. 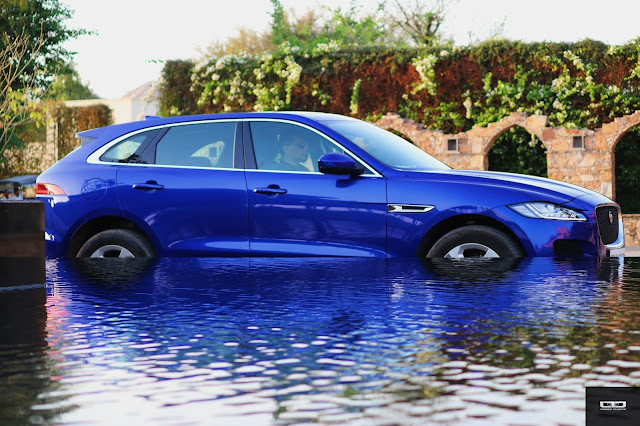 Overall, the F-Pace is an out and out driver's car. There is absolutely no body roll, which is quite remarkable for an SUV. There isn't any annoying lag or jerkiness either, but we did feel that the engine could have been a bit more punchier. The racing inspired sonic note also takes a while getting used to, as one would expect a more menacing growl from an SUV. But what it loses out on sheer power, it makes up in terms of sheer thrill. The F-PACE drives less like an SUV and more like a hot hatch or sports car, and the minimal body roll makes for a driving experience second to none. It is nimble around corners, and when it comes to SUV driving dynamics, this clearly sets the benchmark. While the ride quality may seem slightly compromised due to the firm suspension, its effect on the handling more than compensates for it. Thrill is an addictive side effect if you are behind the wheel of this one. With its first foray into the segment, Jaguar has created a fine example of an urban performance SUV. It differentiates itself through character and purpose, in an otherwise crowded space. While there may be several options to choose at its price point of INR 60.02 lacs (ex-showroom); with more engine options, more power and relatively bigger cabin space, there is something about the F-PACE that makes it immensely practical. It is what we would call just right sized for urban needs, delivers impressive efficiency (we got 14.5 km/l even when driving in Sport/ Dynamic mode most of the time), is extremely well styled, has a great build quality, feels comfortable and safe, and drives better than any other SUV in the segment. To top it all, it's a Jag. And that makes for quite a package. With the F-PACE, Jaguar has built an object of outright desire in a segment that never cared much about vanity. And for that, it has no competition. Yet. Which makes it worthy of a hat tip.